Learn Liquid Physics with Fun App Where's My Water? Learn Liquid Physics with Fun App Where’s My Water? I don’t know much of the video games my son plays. But at least when he mentioned the name, I know what it is about. When the games got on iPad, the situation became worse. All I see is the little icon on the screen, I did not get to watch him play anymore, since it is so portable and so small, he can easily hide in a corner and I would not know where he is. One day, I felt the need to censor his games on the iPad. While flipping through the games on the screen, I run into this game called “Where is my water?” It is from Disney. The minute I started to play, I got hooked. It is a very well designed game. It is all about physics. If Angry Bird is about solid falling object physics, this can be its counterpart on liquid physics. The story for the game: Swampy the Alligator lives in the sewers under the city. The goal of the game is to guide water through his damaged plumbing to reach his shower! To success in the game, you have to be strategic when you encounter the algae, toxic ooze, triggers, bombs, and traps. There are over 100 challenges with increasing difficulties. 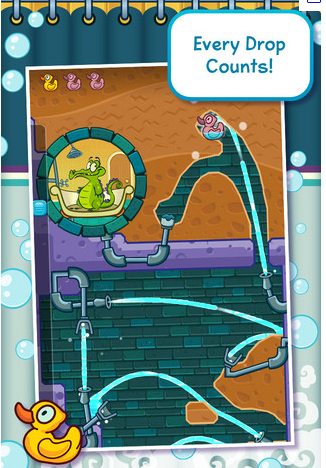 Along the way, you get to collect Swampy’s shower items to unlock bonus levels. Who can play: judging from my child, anyone 6 or older should be able to enjoy the game, and learn something from the game. When I say “learn something”, I don’t mean they will actually learn the physics, but they will notice how the liquid moves and get some sense of liquid physics. The game also requires some strategic planning. For example, you want to use the toxic ooze to kill the algae first, before letting the water run over it, otherwise the water will cause the quick expansion of the algae thus block the water flow. Kids at a younger age may not capable of thinking through the strategies to win the game. What is your game experience and your favorite game? Where is my Water is available for iPhone, iPod and iPAD. It is $0.99 on App Store. 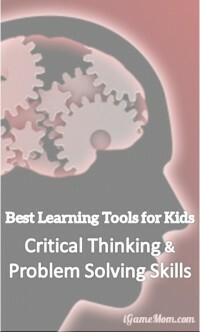 If you like Where’s My Water, you will also like Best Learning Tools for Kids – Critical Thinking and Problem Solving Skills. Next post: It Is Real Money!